Demo is still going strong at our house. In fact, I am sitting down at Mom's house with the kids to steer clear of the messy job of scraping popcorn ceilings. Soon after the ceilings are done, we will be starting electrical work. I am going to be hearing "Oh architect!" (me), "what is the lighting plan?" So I'd better have it figured out. First up is deciding what configuration to go with. 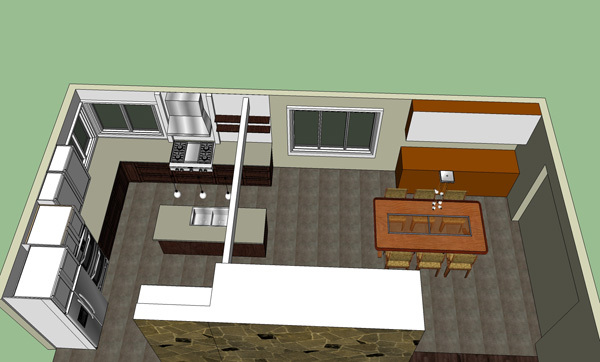 There is a beam that intersects the kitchen (shown in white) right above the island. It is 12" tall. I will have to figure out the best lighting placement around that. 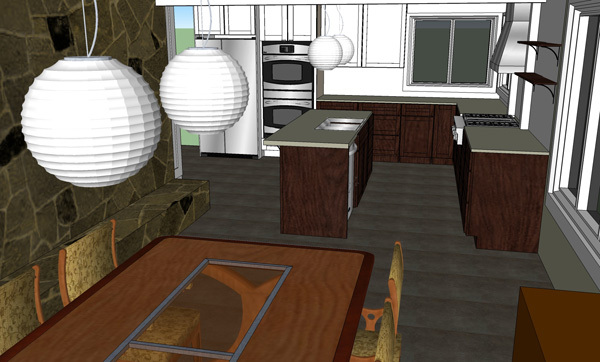 One option would be to hang 2 pendants each over the island and dining table. All the same? Different? The problem I see with this idea is that they won't line up. The table in this drawing looks nothing like mine (just there for placement!) and the lighting style isn't right either. Read on for that. 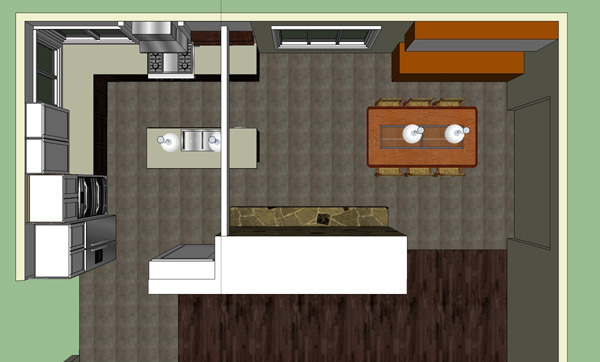 Another option would be to have pendants over the island and more of a chandelier type fixture over the table. This is the option I favor I think. I should mention that I intend to have a smattering of can lights throughout. They will be positioned to illuminate my countertops. 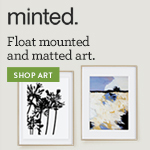 I've been a long time fan of these pendants from Pottery Barn. I even have a friend who has some to get rid of. Cons: They might be a bit traditional. 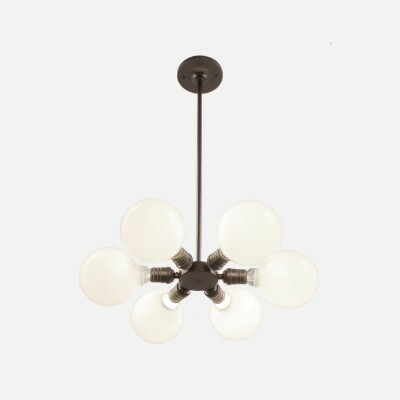 I'm hoping to have some mid-century influence in my fixtures. Also, the glass gets dusty and looks like it would be hard to clean on the inside. 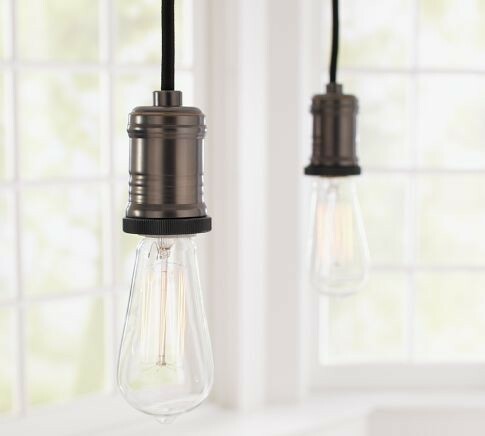 The bulbs are exposed, so I would be spending more on either Edison bulbs or LED bulbs. 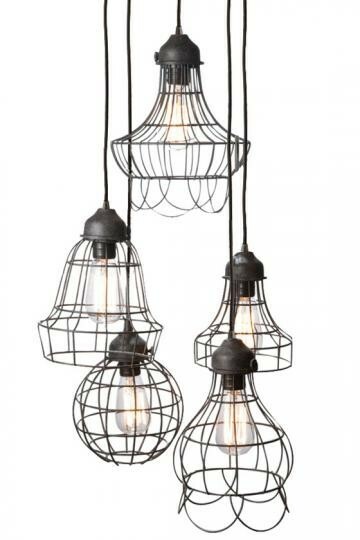 I also LOVE these simple pendants from Pottery Barn. They come on a track with either 2 or 3 lights. The trouble is, I would need to make sure the track would fit okay on one side of the beam and still center over the island. And again, they have exposed bulbs. I think you can buy Edison bulbs on Amazon for about $11 apiece. They don't last very long though. You can buy LED bulbs for around $40—which is a lot—but they will last longer than CFLs. 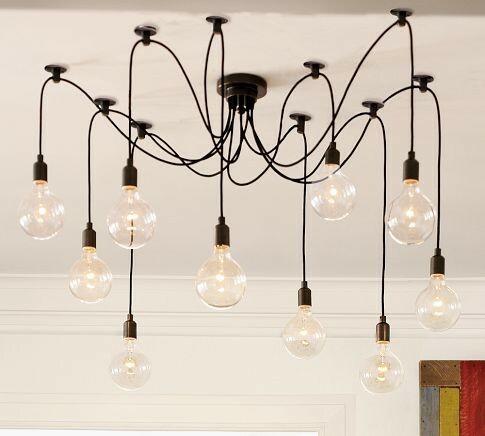 I also LOVE these globe lights from Schoolhouse Electric. In fact I love a LOT of their lighting. These are almost a perfect match to some of the lighting I already have (mine are brass, but I intend to paint them). I love the frosted glass globe—hides the bulb!—but they are also available in a clear glass globe which looks great as well. The trouble with doing frosted globes in the kitchen is that I don't know what would match it in the dining room. Schoolhouse Electric also has these satellite fixtures (a bit atomic, don't you think?) that require a special exposed bulb. They are a bit too pricey to do more than one. 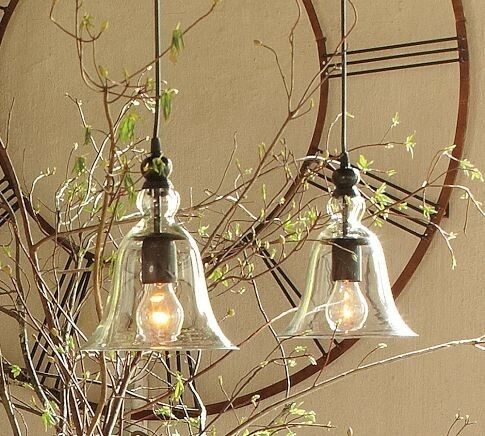 The Pottery Barn Edison Chandelier. Again, exposed bulbs! And maybe a bit too trendy. It was on sale, but just now I'm discovering it is no longer available! Guess that decision was easy. I could go with a simple drum shade. 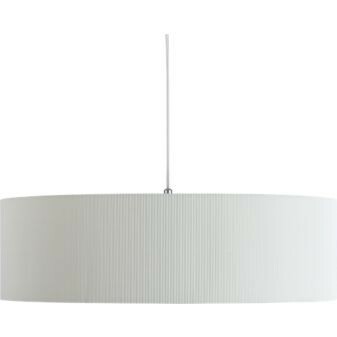 This one is from CB2. 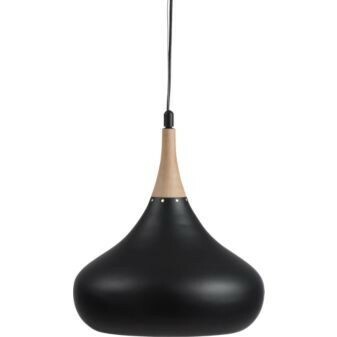 This CB2 Firefly Pendant is in the top running. Again it has an exposed bulb, but if you look closely, they are showing it with CFLs! 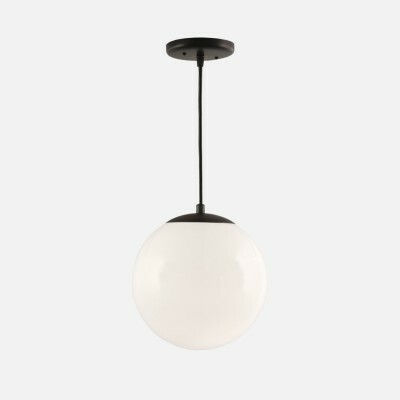 I am also completely smitten with these pendants from CB2. They are larger than you might think (16" in diameter) and pricey if I buy two. I don't think my Mom is a fan. One more just for fun. I'm not sure they are perfect for my house, but i think they are pretty great all the same. They are from Home Decorators Collection. If you are still here after all of that, PLEASE PLEASE PLEASE offer your opinion. I am nowhere near making up my mind on this decision and I need to! Help?